In stock, shipping on January 7th. Please read our General Terms and Conditions and Privacy Statement carefully. 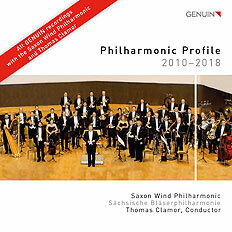 The new sampler CD of the Saxon Wind Philharmonic under its chief conductor Thomas Clamor is a hit: it brings highlights from the nine wonderful productions of the flagship wind orchestra on GENUIN. In addition to the fact that the musicians make music at the highest level and with great enthusiasm, they are characterized by their joy of experimentation. They cross both genres and instrumentation, looking for partners from all disciplines of music and allow us to be astonished time and again by their adaptability. From Bach to Mambo, from Wagner's great operatic works to solemn sacral music, from Venezuelan folklore to Mussorgsky's "Pictures at an Exhibition" - the performance of the Saxon Wind Philharmonic shines in all colors of the rainbow! There is no better way to discover all nine Saxon Wind Philharmonic CDs in all their glory.